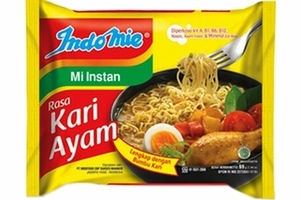 Indomie Instant Noodles With Chicken Curry Flavor (Mi Rasa Kari Ayam) in 2.82oz (80g) pack. Product of Indonesia. Halal Certified حلال . [15 units] Limit 2 per customer! Consumed by: Cambodia, China, India, Indonesia, Laos, Malaysia, Morocco, Pakistan, Philippines, Singapore, Taiwan.. Ethnicity: American, Asian, Chinese, Filipino, Indian, Indonesian, Malaysian, Moroccan, Pakistani, Singaporean, Taiwanese. These are very tasty. If you eat any of the dried noodles from Wal-marts and such, you'll like these. They are a good, quick lunch or dinner. Especially for the price.